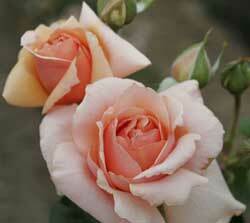 The delicately spicy rose fragrance adds to the classic elegance of this new soft apricot Hybrid Tea. Excellent flower shape, ruffle-edged petals and a gorgeous soft color makes this a wonderful rose to grow, and a beauty in a vase. Above average disease resistance, and strong enough to withstand heat without fading. Grows to 5'+ tall, and is also available in tree form!